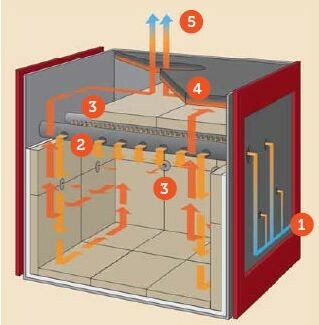 (1) Combustion air is drawn from the room in to the firebox through the rear of the fire. The air is channeled between the firebox wall and the outer tiles where it is heated before entering the firebox. (2) The primary air is drawn into the firebox through the large primary air tube and moves down over the glass as an air wash and backwards into the fire. (3) As the firebox temperature rises, secondary air is drawn into the firebox through smaller intake tubes situated at the top of the firebox and from air jets around the sides and the back of the firebox. This ensures the secondary combustion of wood gases and smoke particles. (4) Superheated gas is drawn up into the chamber above the firebox and heats the cast iron top plate that in turn heats the air. (5) The superheated gases largely stripped of particulates by the secondary burn process are drawn up the flue. 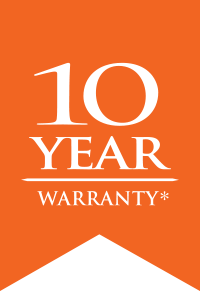 Firenzo woodfires are quality, handmade appliances. Each firebox has a layer of refractory lining, a layer of insulating material then the steel firebox. The double layer of insulation and refractory lining reflects the heat back into the firebox generating temperatures up to 1000°C. That heat is directed up into the top chamber where the cast iron top is heated before the heat travels into the flue. The cast iron acts like a heat sponge, soaking up the heat and then releasing it over night as the fire dies down keeping the warmth. The cast iron heats the air which rises and fills the room from the ceiling down travelling through the house. To warm the room quickly close the door. Because of the generous refractory lining, steel and cast iron it takes some time to get to optimum operating heat but once this is achieved you will use less firewood to keep the fire producing that heat.